A retired marine, Logan is methodical and conservative. Richard is a liberal pacifist who is pathologically afraid of guns. Yet the minute Logan sets eyes on Richard, his heart turns over like an old car engine and it isn’t long before his motor is revved and Richard is in the driver’s seat—even if it seems like each man is driving a different car. 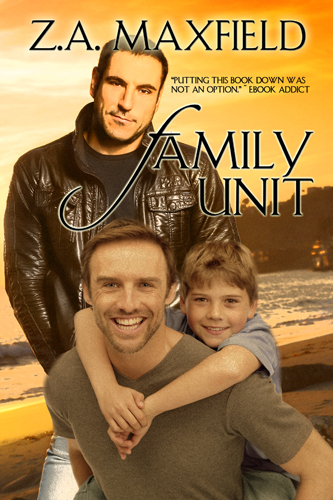 Richard Hunter is parenting his grandson, and the kid—Nick—has had it rough. Richard vows nothing will stop him from creating a loving and stable home. Not even a tempting, red-hot relationship with a very attractive man. However, when Richard looks into Logan’s blue eyes it’s tough to stay focused. It’s never easy to become a family, what with a temperamental eight-year-old, disapproving outsiders, and outright extortion attempts. But when push comes to shove, both Logan and Richard are committed family men who want to make a loving home for a little boy who needs them.